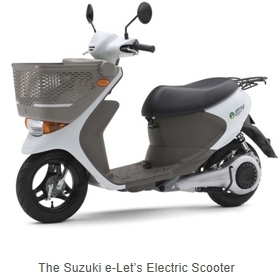 Osaka, Japan - The Panasonic Group today announced that it will supply its electric drive system for Suzuki Motor Corporation’s e-Let’s electric scooter, to be released in January 2012 in Japan. The electric drive system consists of four components: a high performance in-wheel motor*1 and a high efficiency control circuit primarily developed by the Panasonic Group, as well as an electric motor battery system using consumer-use lithium-ion batteries and a dedicated charger that are backed by the Group’s proven track record in the battery field. Amid growing public concern over environmental protection, the development of electric vehicles, including two-wheelers and automobiles, is gaining momentum. Building on its experience in the electric assist bicycle market, the Panasonic Group has been cultivating technological expertise in drive motors and control circuits. 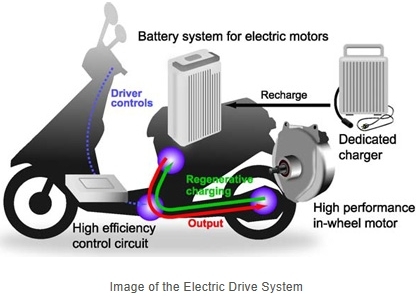 In September 2010, the Panasonic Group, in collaboration with Suzuki, succeeded in developing a high performance in-wheel motor with regenerative braking capabilities and a high efficiency control circuit for Suzuki’s prototype electric scooters, which have undergone on-road testing. The Panasonic Group has been honing its technologies in motor control and rechargeable batteries over the years, which led to the development of the four components that comprise the core of light electric vehicles. The agreement with Suzuki has set an example for the Panasonic Group in delivering the four components as a total electric drive system for two-wheeled vehicles. The Group now aims to supply this total solution for light vehicles to companies actively developing electric vehicles. The Panasonic Group continues to create and expand new markets in clean mobility, accelerating its efforts to contribute to achieving a low-carbon society. An announcement has been made by Suzuki about the e-Let’s electric scooter today. *1 An in-wheel motor is a drive motor which can be incorporated into the hub of a wheel. A special characteristic of in-wheel motors is that the motor and tire axels are on the same axis. The drive mechanism can be fit completely into the wheel, which simplifies the structure of the vehicle and offers more flexibility in the design of the vehicle.